Passions of Paradise offers guests the chance and dive or snorkel on an amazing day trip to the Outer Great Barrier Reef! You'll get a chance to see unique marine life at two different locations, visiting with the marine life and enjoying all the beautiful sights! 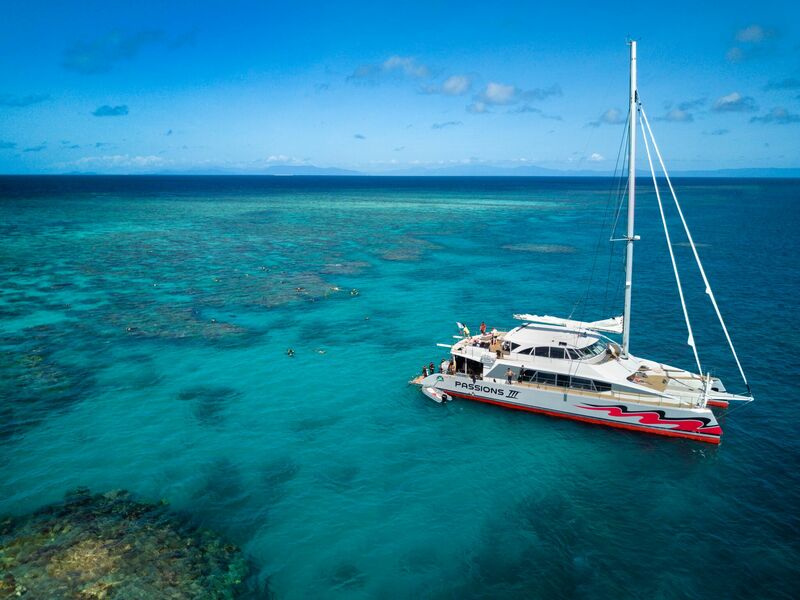 The high-performance catamaran sails daily from Cairns giving you the chance to explore the Great Barrier Reef, where you can enjoy the opportunity to snorkel or scuba dive! With Passions of Paradise you can look forward to a fun day of exploring, whether you choose to dive, snorkel or want to do both! Enjoy a quality day trip at the amazing Great Barrier Reef at an affordable price. Book your friends and family it today. Snorkel or dive during your one day tour and immerse yourself into the beauty of the Great Barrier Reef. This tour is ideal for both introductory and intro divers, as well as for practiced snorkellers and beginners, making it an amazing way for anyone to see the Great Barrier Reef. You'll stop at two different locations based on the weather conditions, including 1770 reef, Split Bommie, Coral Gardens, Paradise Reef, Long Bommie, Pretty Patches and Turtle Bommie. Sea turtles are common and you are also likely to see giant trevally, small black tip reef sharks, bat fish and hundreds of species of colourful reef fish, while Paradise Reef is an exclusive mooring just for Passions so there are no crowds as you snorkel or dive on the outer Great Barrier Reef. It is a hard coral reef featuring a ribbon of small reefs. With depths of up to 25 metres along the edge, water clarity is good and the area is host to many exciting fish species including Wally, our resident Maori wrasse. Passions offer Intro Divers: A FREE "try before you dive" policy which means you are welcome to join the briefings, get into the water and use apparatus for 5 minutes before deciding to continue with your dive. All of the snorkelling equipment you will require is supplied as part of your trip, including a wetsuit or stinger suit and prescription masks are also available upon request. Lunch is a tropical buffet style of cold cuts, salads and fruit, complimentary tea, coffee and chilled water are available throughout the day. Hot showers are available for those who wish to warm up and wash the salt off them after diving! $20 per person reef levy is payable at check in. All scuba diving is subject to the completion of a medical questionnaire on board. Some medical conditions and/or prescription medication may preclude you from diving. Please call us in advance to discuss any concerns you might have.